Serums is one of the most daunting skincare product categories. There are so many out there that it's hard to decide which one you may need. But the one thing I know for sure is that having one is probably not going to address all your concerns, at least it doesn't address all of mine. There are serums that can address various skin issues at once, but having a few serums with specific purposes really helps to round out my skincare and give my skin exactly what it needs. 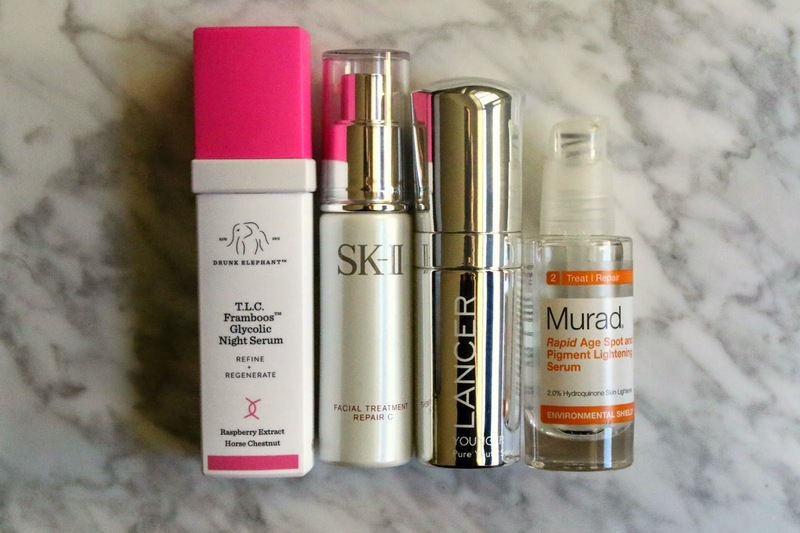 I find there are typically four categories of serums that I like to have on hand at all times. While I know that serums are more of an investment piece, they often last much longer than other skincare products so hopefully they can be acquired over time rather than all at once. Here are the four categories of serums I like to keep in my routine along with recommendations of my favorites. 1. Retexturizing Serums - These are the serums that help to refine the skin, address uneven texture and help minimize the appearance of pores - I think of them as my glow getting serums. They typically have some ingredient in them that exfoliates allowing for the dead skin to be sloughed away and for newer, brighter skin to shine through. Another benefit is their ability to decrease dark spots and hyperpigmentation, though not as well as a targeted treatment, but there can still be some effect. I also find that I have the best results with reducing breakouts when using these types of serums because if I'm exfoliating away the dead skin, it can't clog my pores. Yay! I've recently been using the Drunk Elephant Glycolic Night Serum and really enjoy the delicate yet effective exfoliation I get with it. I wake up the next morning and my skin is smooth, soft, refined and more even toned. It does tingle at first when I apply it, but that goes away after a few minutes. A few other serums that fall under this category that I enjoy are: Perricone Blue Plasma, Ole Henriksen Invigorating Night Treatment and Lancome Visionnaire. 2. Hydrating Serums - I find that the results from hydrating serums can overlap often with the results from anti-aging serums, because if the skin is well hydrated, it will look fresh, supple, radiant and youthful, right? I specifically like to have an intensely hydrating serum in my arsenal because though I am oily, my skin often gets dehydrated. I reach for these serums year round when my skin is irritated or sensitive, and they are perfect at helping to balance my skin and bring it back to baseline. The SK-II Facial Treatment Repair C is an intense treatment that I've recently discovered that delivers much of the same results as the iconic SK-II Facial Treatment Essence but just in a more concentrated formula. Some of my other favorite hydrating serums include Mario Badescu Herbal Hydrating Serum, Kate Somerville Quench Oil Free Serum, and Tatcha Luminous Deep Hydration Firming Serum. 3. Anti-Aging Serums - This category of serums addresses numerous concerns such as fine lines, wrinkles and loss of elasticity. While many different serums could fall under the "anti-aging" umbrella, those that help to stimulate collagen production, and prompt cellular renewal and cell turnover are some of the biggest indicators of an anti-aging treatment. I like to use one in my routine when my skin seems to be losing it's tone and firmness. I am a huge fan of the Lancer The Method routine (read my review here), and many of his products are great for targeting anti-aging concerns. This Pure Youth Serum helps to stimulate the production of new cells and the regeneration of collagen - and never fails to really firm up my skin when I use it regularly. The other anti-aging serums that I have enjoyed are Verso Super Facial Serum, Clarins Double Serum and Sunday Riley Good Genes. 4. Hyperpigmentation Serums - I don't think there is a single person out there that does not struggle with some form of hyperpigmentation. Either from old acne scars, age spots, sun damage or hormonal issues - it affects everyone. Sadly once the spots arrive, it is incredibly hard to get rid of them unless you bring out the big guns. Serums like Murad's Rapid Age Spot and Pigment Lightening Serum tend to be the most effective because they make use of strong ingredients such as hydraquinone to help lighten those spots. I've been using the Murad serum for years now and find that it does wonders with my pigmentation issues. It works on any skin tone from fair to dark and is a product I regularly hear about from my readers praising it's effectiveness. 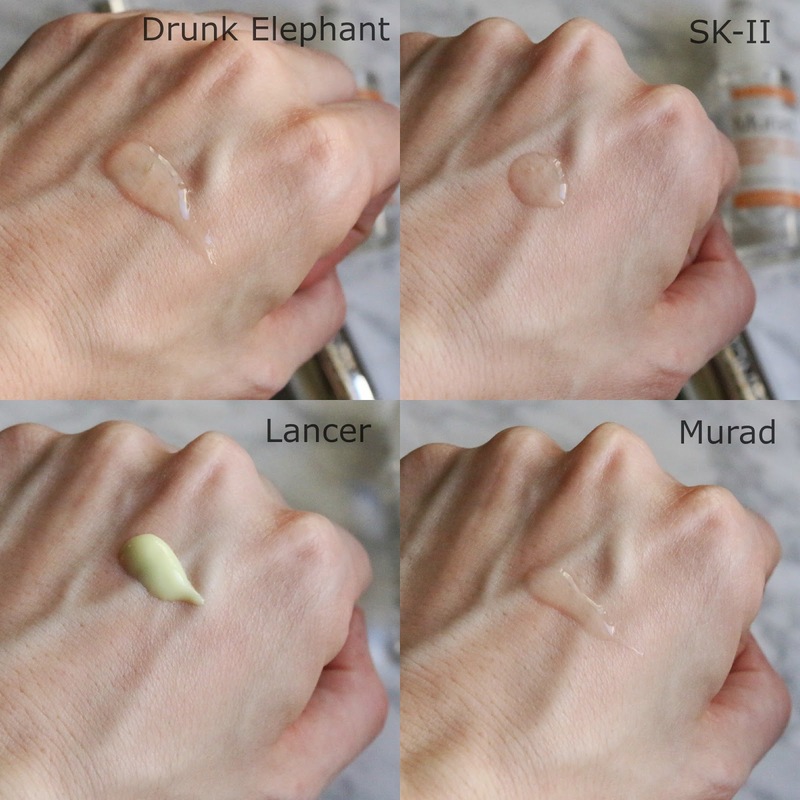 I don't have too many other serums that work as effectively as the Murad but here are some worth considering if the Murad doesn't work - Verso Dark Spot Fix and Peter Thomas Roth De-Spot Plus. HI Casey! Yes I do, but P50 and First Aid Beauty are very different in strength in my opinion. P50 didn't work for me but it is stronger exfoliant. FAB radiance or blemish pads are MUCH more gentle so adding in a retexturizing serum is no problem for me at least.. But you also have to know what your skin can handle because there are some people that may find it too much with both an exfoliating toner and then serum.